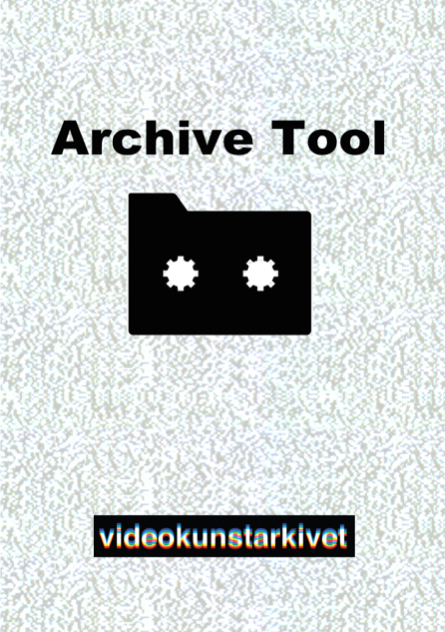 Archive Tool is a DAM software initiated by Videokunstarkivet, conceived and developed in close collaboration with Norgesfilm and Toxus. A setup guide and documentation of Archive Tool can be downloaded here. Videokunstarkivet (The Norwegian Video Art Archive) is a pilot project initiated by Arts Council Norway in 2011. The archive is being developed by PNEK (Production Network for Electronic Art) in the years 2012-2016, after which the project will develop into a permanent structure (pending). Mapping and collection of all video/film/media artworks that is produced in Norway since the mid-1960s. Development of a solid database tool (DAM), built on open technology standards. Creation of a user-friendly interface for the database. Digitization of older physical formats to uncompressed digital files. Management of secure user/access levels to the database. Archiving old cassettes and playback equipment. Research and solid foundation to academic standards. Communication with both professionals and the general public. By Archive Tool we mean the interface towards the administrative and external users of Videokunstarkivet and which is tailor-made to the requirements of the project. Development and adjustments include functionalities, workflows, access levels and design and has been developed by Toxus in collaboration with PNEK and Norgesfilm. Archive Tool builds upon the functionality of ResourceSpace, the open source DAM software used as the background platform for Videokunstarkivet. The purpose of the software is to have a solid base for storing, organizing, sharing and distributing digital assets that complies with the most common requirements and standards within public sector regarding archiving, integrations and development across different academic systems and environments. Completely new layout and presentation of Artists and Artworks. New search/presentation of Artworks and Artists. Moderation system. As a moderator you have full control of changes in metadata and you can rollback several changes in time. View changes per time or per groups. Access Manager. Lets you design new groups with rights and fields view, add new subgroups to parents groups, inherit or degrade rights. Upload large masterfiles with standard FTP and use queue manager to archive master files and transcode the files. This gives the possibility to add several files to the transcoding queue and they are handled one at the time. Reports. Lets you design and export your own reports and statistics on the fly, based on a combination of elements/meta tags in the database. Filesharing, distribution and security management (artworks/master files/ additional files/metadata). Archive Tool is licensed under MIT. Copyright © 2015 Videokunstarkivet, Norgesfilm and Toxus.